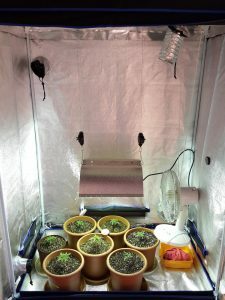 The first consideration to make in deciding between grow tents and a retrofitted room is that every room in a building is unique. Different locales within a building experience weather and temperature fluctuations differently. These variances are this due largely to directional positioning as well as the “level” of the building. To elaborate, a garage has far less insulation and environmental protections than a bedroom does. Even more, if the garage door is facing in a northerly direction, it will receive far less sunlight and stay far cooler than a garage with a door facing south. If one is living in a northern state and is planning on setting up an indoor cannabis operation during the wintertime, cold temperatures are a huge concern. In this instance, grow tents likely will be a bad choice for horticulture because they don’t offer the insulation that is available with a custom built room. Another important variable in deciding between grow tents and retrofitted rooms is whether the home is rented or owned. Most importantly, you should never attempt to set up a cannabis garden in a rented home without the given consent of their landlord. That being said, it is safe to assume that grow tents have far less of an impact on a home than retrofitting a room does. Grow tents have sturdy interior frames which support a good amount of equipment. As such, they allow growers to set up a grow area without drilling and cutting holes into walls and ceilings. Also, the bottoms of tents are both “lipped” and waterproof. These features should keep excess water from destroying the floors beneath. As such, grow tents are a far less intrusive option for growing a crop in a respectful manner. They are ideal for small-scale, personal gardens. The infrastructure of the cannabis garden area is the next most important element in deciding between a tent and a room build-out. This notion is directly related one’s personal desires for the scale of their indoor garden operation. 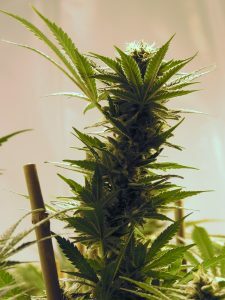 It is rather unlikely that a cannabis gardener can successfully set up a 12,000 watt flower room in a grow tent. This set up would require 12 ft x 16 ft of space just for the garden canopy. This figure does not account for room for both equipment and working. Grow tents are made large enough to house a 10,000 watt flowering garden. However, the amount of “customizing” necessary to make this scale work makes them unpractical. As indoor operations reach this level of size and complexity, the demands of infrastructure change. Individuals using grow tents will spend vast amounts of time figuring out how to situate all the necessary equipment. In the end, this notion directly contradicts the beautiful simplicity of grow tents. Next, indoor cannabis cultivators must discern whether the area in question will be used for vegetative growth or for flowering. In practically any indoor growing scenario, grow tents provide an excellent place for vegetative growth. Grow tents work great for early plant development stages. Because, these periods don’t generally require as much wattage as flowering phases. To this end, for lighting, low temperature fluorescent T5 and LED lights do the job for vegetative growth. Furthermore, cannabis flower rooms require far more environmental controls involving CO2 and temperature. This extra equipment is very difficult to situate within the small confines of grow tents. Point being, if one is looking to use a tent for flowering phases, it will likely only be successful and practical on a small, personal scale. One more critical element to be conscious of in discerning between the use of grow tents and room build-outs is the types and amounts of materials needed. As almost all indoor cannabis growers know, one must embark on countless trips to hardware stores and hydro shops in the retrofitting of a room. Moreover, these shopping excursions are often due to a plethora of “hidden expenses” for the build-out. These are often not calculated in one’s original budget. In extreme cases, growers living in the countryside often have to drive 20 minutes in each direction to acquire supplies. On the contrary, for small scale operations, grow tents require almost no additional materials in the construction of a stable cultivation environment. Furthermore, tents allow for growers to devise a far more accurate cost analysis of a set-up in the procurement of materials. This article originally appeared in the April 2017 issue of Maximum Yield Magazine.